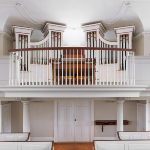 After undertaking a major renovation of its building and its organ, an 1879 E&GG Hook & Hastings, Opus 956, the 260 year old congregation of Lamington Presbyterian Church in Bedminster, New Jersey decided to have its 15 facade pipes restenciled. 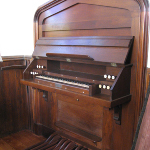 Andover Organ Company took on the project with consultant MaryLou Davis of Woodstock, CT, assisted by Eleanor Richardson of Andover. Tonal Director John Morlock carefully stripped the beige latex paint off the existing pipes to reveal stripes, medallions and fleur-de-lis in varing shades of Victorian brown. Davis observed that these muted colors were typical of the 1880s, a time of economic and psychological depression in America. In order to blend with the blues of the present renovation, Davis modified the colors of a few sections of the pipes slightly, while carefully selecting colors typical of the Victorian era. She traced the original designs, and cut mylar stencils to reproduce them. Richardson then measured the placement of the designs, stripped the pipes, and repainted them. All agree modestly that the result is stunning. 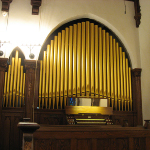 This organ has been renovated several times over the years, reflecting different trends in organ design. 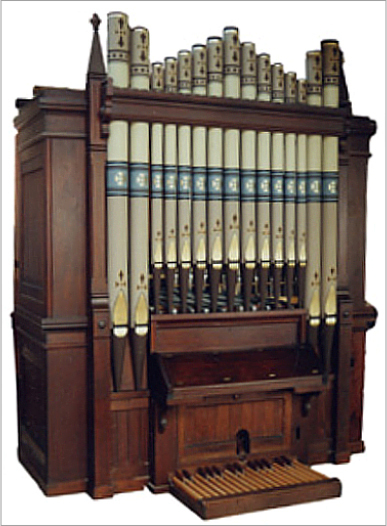 In November, 2001, the organ returned to Lamington with the most recent mechanical and tonal renovations completed, returning it from a North German Baroque to a more American sound, compatible with its original character.